It has been an active and productive fall and early winter for Global Water Futures (GWF) with new projects, faculty investigators, students and partnerships since September 2018. Canada’s river basins are at the forefront of impacts from both development and global warming. Finding solutions for how to best predict, prepare for, and manage water futures is a global imperative. 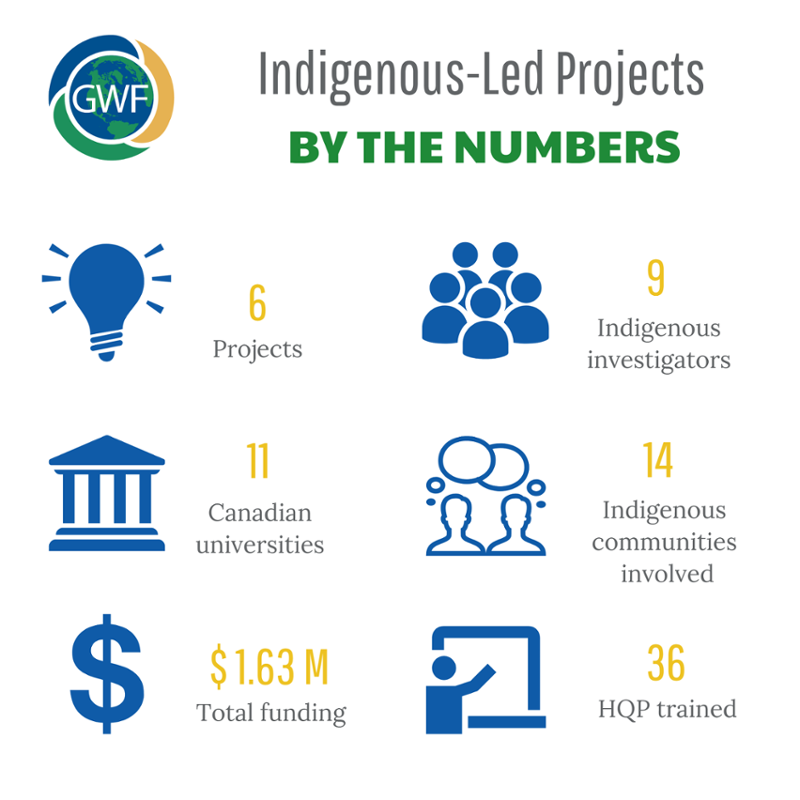 GWF is active across Canada and becoming well know around the world as the largest university-based freshwater research program in the world – one that is directed toward finding these solutions. GWF has renewed membership on its Strategic Management Committee (SMC) adding Dr. Corinne Schuster-Wallace of University of Saskatchewan for water, health and gender issues and Dr. Deborah McGregor of York University for Indigenous water knowledge and governance. Dr. McGregor is a member of Whitefish River First Nation, Birch Island, Ontario. Now with 11 members reflecting equity, diversity and inclusion across Canadian universities, the federal government and a First Nation, the SMC has the breadth of experience to fully evaluate and manage transdisciplinary water science. 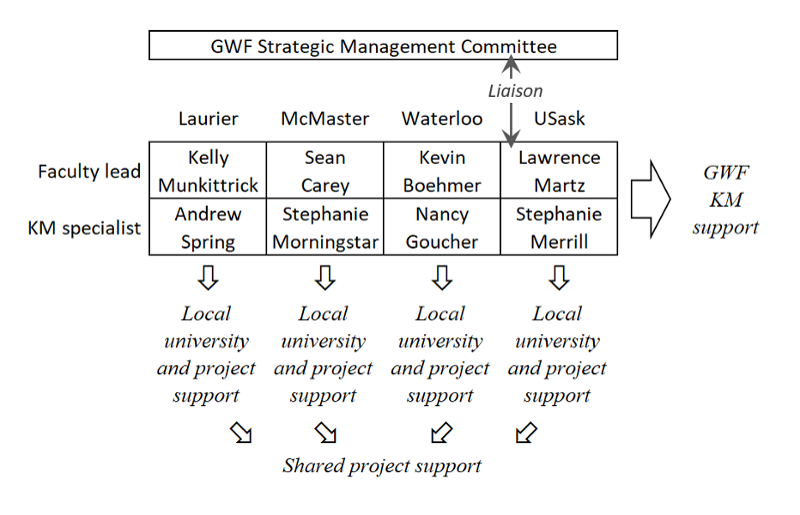 The GWF Operations Committee of representatives from all projects and core teams is now called the Operations Team to reflect its larger membership (~80 people) and is holding its annual meeting at the University of Saskatchewan on Jan 22nd-23rd. Knowledge Mobilisation (KM) is extremely important to GWF and so the Core Team was expanded from 3 to 4 specialists, by including one person who is a member of a First Nation. Each partner university has designated a KM faculty lead and hired a KM specialist, each specialist reports to the faculty lead at their respective partner university, each specialist provides KM support to projects led by their local university and contributes to shared KM support for projects led by other universities and agencies. The team as a whole provides support and advice to the SMC regarding the GWF-wide KM strategy and the SMC has designated one of its members (Lawrence Martz) to be its liaison with the KM Core Team. A new KM governance structure was instituted to ensure effective governance of the Team and is shown below. GWF has approved 6 new Indigenous community water research projects, each of which was co-created and is co-led by an Indigenous community Co-Principal Investigator and a GWF university Co-Principal Investigator. These Indigenous-led water research projects involve 14 Indigenous communities and 11 GWF universities and will train 36 HQP using $1.9M of funding from GWF. Adding on to the existing 21 Pillar 1 & 2 transformative science and big data projects, and 12 Pillar 3 user question-led projects this brings the number of GWF projects up to 39. In addition there are 6 Core Teams. 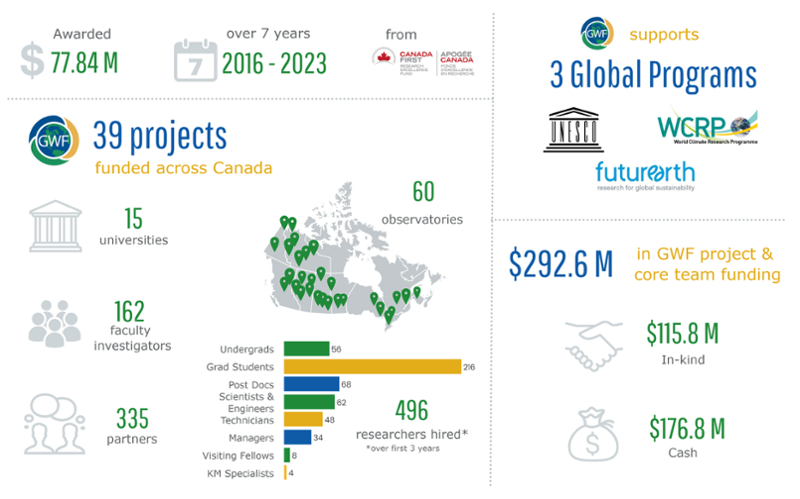 These projects and teams involve 162 faculty investigators and 496 HQP working at 15 Canadian universities with 335 partners at 60 water observatories across Canada. GWF established and funded a Young Professionals group to stimulate the interaction, inclusion and participation of young professionals and early career researchers in activities that represent and pursue the interests of the YP community within the broader scientific landscape of GWF. There are four chapters, one at each of the four partner universities. The GWF YP have enriched GWF considerably with their energy and new ideas. GWF has three formal seminar series as well as ad hoc seminars at the four partner universities – they are videoed and made available to the broader GWF community. The Distinguished Lecture Series is held from September to November and is recorded and broadcast live to all GWF researchers. The Women and Water Lecture Series occurs from December to April and will be broadcast live to all GWF researchers. The Knowledge Mobilisation Webinar Series runs between October and April and shares examples of successful initiatives in action, and discusses and troubleshoots common challenges that arise in KM across GWF. GWF organized a substantial national meeting of 65 water scientists and managers in Ottawa on 27-28 November, 2018. The meeting was hosted by all three science directorates of NRCan and included senior science representation from Environment and Climate Change Canada, Statistics Canada and Agriculture and Agrifood Canada. The meeting evaluated how GWF and federal science departments can better coordinate their water research to promote more effective national water security research and development. A highlight of the meeting was the signing of an MOU between GWF and NRCan that forms a framework for cooperation in collaborative investigations and scientific exchanges to support water futures research. One aspect of the collaboration with NRCan is a state-of-the-art water futures prediction modelling system that GWF is developing for the Bow River Basin above Calgary – this is funded by NRCan, Government of Alberta and the City of Calgary. GWF is currently developing and operating a flood forecasting system for Government of Yukon and is testing one with Government of Alberta – these are developed in partnership with Environment and Climate Change Canada. GWF has established the Smart Water Systems Laboratory with funding from Western Economic Diversification to develop new water sensors and drones for remote sensing and is designing, building and launching a new satellite mission to monitor Canada’s water in collaboration with Honeywell Canada. GWF provides scientific and policy support advice to provincial and territorial governments and to the federal departments with an interest in water. This includes frequent collaboration and interactions with scientists and policy analysts, briefings to the DG, ADM and DM levels in departments, and meetings with Ministers and Parliamentarians. GWF is working with Environment and Climate Change Canada to host the first National Flood Forecasting Meeting in Canada’s history at Vancouver, BC on 20-21 Feb – all provinces and territories will send representatives to this meeting to design a national flood forecasting strategy. GWF has increasingly been recognized internationally. GWF was recently approved as a Regional Hydroclimate Project by the Global Energy and Water Exchanges project (GEWEX) of the World Climate Research Programme in Washington, DC. 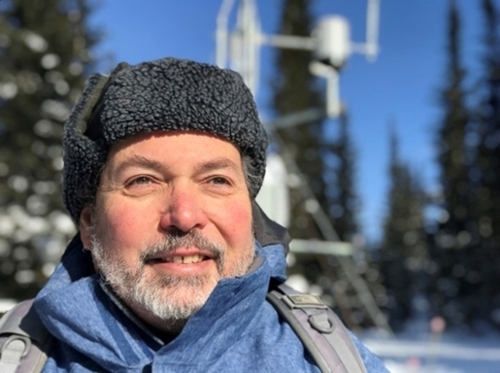 GWF hosted the GEWEX Open Science Meeting in Canada for the first time in May 2018. International linkages to research in 26 mountain research catchments around the world through the International Network of Alpine Research Catchment Hydrology http://www.usask.ca/inarch/, a cross-cutting project of GEWEX with which a joint meeting was held in Santiago, Chile over 24-26 October 2018. GWF is organising a meeting, “Towards a Sustainable Water Future” with the Sustainable Water Future Programme of Future Earth in Bangalore, India in September, 2019. GWF is co-chairing a High Mountain Summit for the World Meteorological Organisation in Geneva, Switzerland in late October 2019. A Memorandum of Understanding has been signed that will strengthen both Canada and China’s commitment to managing freshwater resources globally in a time of rapid climate change. The partnership involves GWF and the Chinese Academy of Sciences Third Pole Environment (TPE) program. The MOU is a direct outcome of discussions between GWF and TPE at the Open Science Conference of the World Climate Research Programme’s Global Energy and Water Exchanges Project in Canmore, Alberta in May where the need and opportunity for greater global collaboration was identified. Through initiatives such as collaborative research projects, personnel exchanges, and exchanges of scientific information and technical data, the goal is to advance water and climate research in critically important areas – especially the high mountains of Canada, the Arctic and the Tibetan Plateau, which is also known as the Third Pole – including climate change impacts on ecosystems, river basins, water bodies and natural resources development.